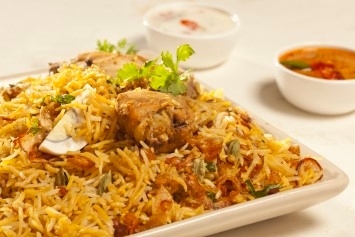 I love Indian food and chicken biryani is one of my favorites. I have long wanted to make an authentic tasting biryani recipe and finally have one to share. The list of ingredients may look long, but it isn’t a difficult dish to prepare at all. It does take some time though, so this one isn’t a 30 minute meal. Wash the rice several times. Allow it to soak in a large bowl of water and salt for at least 1 hour before cooking it. Slice half an onion into thin rings and reserve. Put the remaining onion, garlic, ginger, 1 tablespoon of oil and a bit of water into an electric grinder, food processor or blender with a few of the slivered almonds. Grind to a paste. Heat the remaining oil on medium high heat and fry the onion rings until golden brown. Remove with a slotted spoon and drain on paper towels. Fry the remaining slivered almonds until golden on each side add to the onion rings. Cut the chicken into small pieces and toss in seasoned flour mixed with the chili powder. Fry the chicken until golden in a bit of hot oil and drain on kitchen paper. Fry the paste that you made in the oil in the pan. Add the yogurt, 1 tablespoon at a time, with the lemon juice. Add 4 tablespoons water and return the chicken to cook over low heat for 15 minutes. Add the coriander, cumin and cinnamon to the chicken after 5 minutes and stir well. Meanwhile cook the rice in 4 1/2 cups boiling salted water with the turmeric for 10 minutes and drain. Spread the drained rice on top of the chicken casserole. Add the almonds. Preheat the oven to 300°F. Cover the mixture with foil and then the casserole lid, and bake in the oven for 35 minutes. To serve, mix the chicken and rice well with fork and turn into a heated dish. Garnish with sliced hard-boiled eggs, and browned onion rings. Indian rice recipes are best make with Basmati rice, the rice used by Indian cooks for their biryani and pulaos. You can substitute plain white rice but Basmati holds it shape better and has a nicer flavor. You can find it in pretty much any grocery store. You can use boneless chicken in the recipe instead of bone-in. You can also make this recipe vegetarian by simply omitting the chicken. This biryani recipe may just look like chicken and rice, but it is a nutritional powerhouse. The spices, yogurt, ginger, onion, garlic and lemon in this recipe all bring fantastic nutrients and health benefits. You can serve this Indian rice recipe either as a main course or a side dish. It can be served with another vegetable and a salad for a delicious meal with little meat. Try pairing this chicken biryani recipe with spicy green beans or a chick pea curry.